The first description of intracranial aneurysms dates back to the 17th century (Wiseman, 1676). 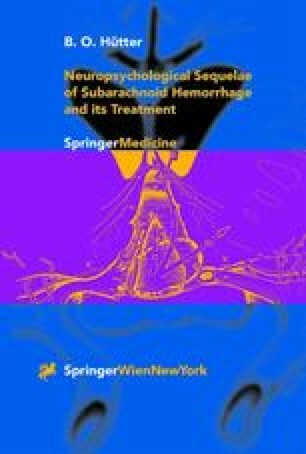 However, two further centuries went by until Hodgson (1815) and later Bramwell (1886) recognized the extravasation of blood under the arachnoid of the brain as the consequence of the rupture of an intracranial aneurysm and named this form of hemorrhage “subarachnoid hemorrhage” (SAH). Until the beginning of the 20th century, a specific and systematic treatment of ruptured intracranial aneurysms was not possible because of the lack of adequate diagnostics (Beadles, 1907; Keen, 1890). The surgical treatment of ruptured intracranial aneurysms developed very slowly and was, despite all efforts, associated with a considerable mortality and morbidity. However, an enormous progress in neurosurgical treatment methods within the last 30 years has led to a considerable improvement of the prognosis. The introduction of the operating microscope, the concept of early surgery within 72 hours of the bleeding, specialized intensive care units, the calcium antagonist nimodipine and a highly differentiated pre-and post-operative management have contributed essentially to this advance (Hütter et al, 1999; Ljunggren, Sharma and Buchfelder, 1993; Kassell et al., 1990a;b; Gilsbach and Härders, 1989; Gilsbach et al., 1988a; Ljunggren et al., 1987; Drake, 1981). This implies that in the meantime 50-60% of all patients after the rupture of one or more intracranial aneurysms can be regarded as functional survivors (Kassell et al., 1990a;b; Gilsbach and Härders, 1989; Gilsbach et al, 1988a; Ljunggren et al., 1987).